Last January, when a number of white conservatives used words like "arrogant" and "cocky" to refer to President Obama after his State of the Union speech, MSNBC host Keith Olbermann asserted that they really meant Obama was an "uppity" black man. Olbermann: "When racist white guys get together and they don't want to be caught using any of the popular epithets in use every day in this country about black people - and there's a chance one of them, or worse still a white guy who doesn't get it might wander in and hear the conversation, when there's a risk even in saying 'uppity' or 'forgetting his place,' the racist white guys revert to euphemisms and code words. And among the code words that they think they're getting away with are 'cocky,' 'flippant,' 'punk,' and especially 'arrogant.'" TOM BUFFENBARGER: DATED FEBRUARY 19, 2008: We began to take a closer look at the wunderkind. Know what we saw? A guy with two different positions. Nose in the air pontificating when the coast is clear. And as soon as anyone throws a punch, he's in a bum's rush to get the hell away from the conflict. ... I've got news for all the latte-drinking, Prius-driving, Birkenstock-wearing, trust fund babies crowding in to hear him speak. This guy won't last a round against the Republican attack machine. He's a poet, not a fighter. KEITH OLBERMANN, IN OPENING TEASER: Worsts: The right wing calls the President cocky, arrogant, defensive, flippant, like a punk. You know what those are code for, right, when white guys are talking about a not white guy? OLBERMANN, BEFORE COMMERCIAL BREAK: And when conservatives call this President cocky, arrogant, flippant, and a punk, do you think these might be euphemisms for something else? 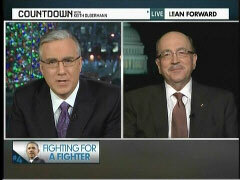 OLBERMANN: But our winners, these guys, assessing not the speech, but the President himself, Eric Erickson, "cocky." John Stossel said he hoped the President would admit he was, quote, "arrogant." Jay Nordlinger, "looks arrogant whether he is arrogant or not." Marc Thiessen, "defensive," "arrogant." John Hood, "flippant and arrogant." Glenn Beck, "like a punk." Here's a little secret, gathered, sadly, from witnessing it my whole life, even from some in my own family. When racist white guys get together and they don't want to be caught using any of the popular epithets in use every day in this country about black people - and there's a chance one of them, or worse still a white guy who doesn't get it might wander in and hear the conversation, when there's a risk even in saying "uppity" or "forgetting his place," the racist white guys revert to euphemisms and code words. And among the code words that they think they're getting away with are "cocky," "flippant," "punk," and especially "arrogant." Mark Thiessen of the Washington Post, Eric Erickson of Red State, John Hood and Jay Nordlinger of the National Review and Glenn Beck and John Stossel of Fixed News, today's "Worst Persons in the World." TOM BUFFENBARGER: This guy won't last a round against the Republican attack machine. He's a poet, not a fighter. OLBERMANN, DURING COMMERCIAL BREAK, WITH AN IMAGE OF HILLARY CLINTON BEHIND HIM: One of her supporters being called "Nostradamus" for his February 2008 admonition about President Obama that he "won't last a round against the Republican attack machine." Tom Buffenbarger joins us next. OLBERMANN: President Obama's decision not just to agree to Republican demands on the tax cut deal but to shut out Democrats of the negotiations, then tell them to take it or leave it, has revived claims by some of his critics on this network and elsewhere that the President does not put up enough of a fight - at least not against Republicans. Nothing like his PR blitz against resistant Democrats this week with hourly email blasts to reporters was seen against the GOP ever. In our fourth story tonight, it turns out that this is not a new accusation against the President. MSNBC contributor Dave Weigel - in his column on Slate - points out that nearly three years ago, in the heat of the 2008 presidential primaries - one of Senator Clinton's themes was that she, not Obama, was a fighter who could take on Republicans. One of her supporters, who joins us in a moment, the president of the International Association of Machinists and Aerospace Workers, introduced Mrs. Clinton in a speech in Youngstown, Ohio, and, in harsh, angry terms, said that union leaders had already seen Mr. Obama back down from union fights with big money business owners. BUFFENBARGER, CLIP #1, DATED FEBRUARY 19, 2008: We began to take a closer look at the wunderkind. Know what we saw? A guy with two different positions. Nose in the air pontificating when the coast is clear. And as soon as anyone throws a punch, he's in a bum's rush to get the hell away from the conflict. Where was Barack Obama? Not on the picket line. Not with us in the state legislature. Not in the United States Senate passing a bill to help us. Not side by side with us at the negotiating table hammering out a deal. No, brothers and sisters. He was off by himself, polishing his wonderful speech about hope and change and, yes, we can. BUFFENBARGER CLIP #2: Hope, change, yes, we can. Give me a break! I've got news for all the latte-drinking, Prius-driving, Birkenstock-wearing, trust fund babies crowding in to hear him speak. This guy won't last a round against the Republican attack machine. He's a poet, not a fighter. OLBERMANN: As promised, we're now joined by Tom Buffenbarker, president of the machinists union and a member of the AFL-CIO executive council. Great thanks for your time tonight, sir.